The Jantzen Building, completed in 1946 and designed by local architect Richard Sundeleaf, sits on Northeast Glisan Street at 20th Avenue. 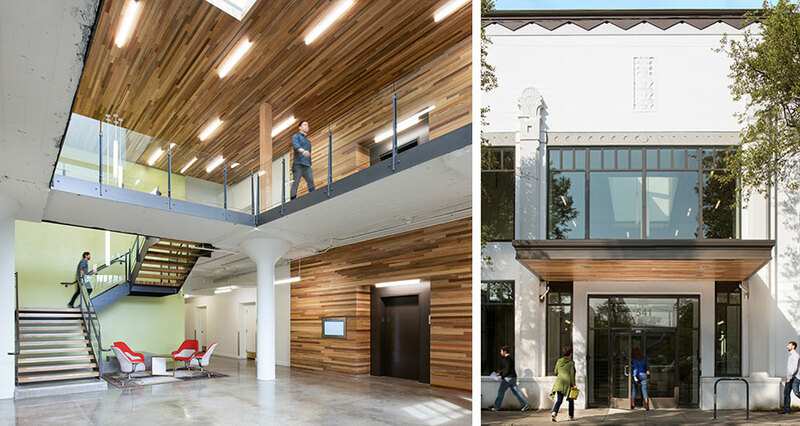 Mackenzie was tasked with giving the landmark, formerly known as the Jantzen Knitting Mills Building, a new identity that would position it as a dynamic and creative office environment for current and future tenants. To satisfy the criteria of the City Planning Commission’s historical design review process, the design team took cues from the building’s historic characteristics and responded by revealing the existing structure in order to celebrate its architectural legacy. Restored exterior entrances and improved interior spaces are decidedly forward-looking in their programming and finishes. Reimagining the main entrance of the building included full restoration of the existing canopy with a new reclaimed wood soffit, as well as replacing the existing blue reflective glass to visually open up the lobby and pull people into the space. The main lobby design includes a new skylight and dramatic lighting that welcomes visitors as they walk up the new open feature stair, made with locally sourced Oregon white oak wood treads. 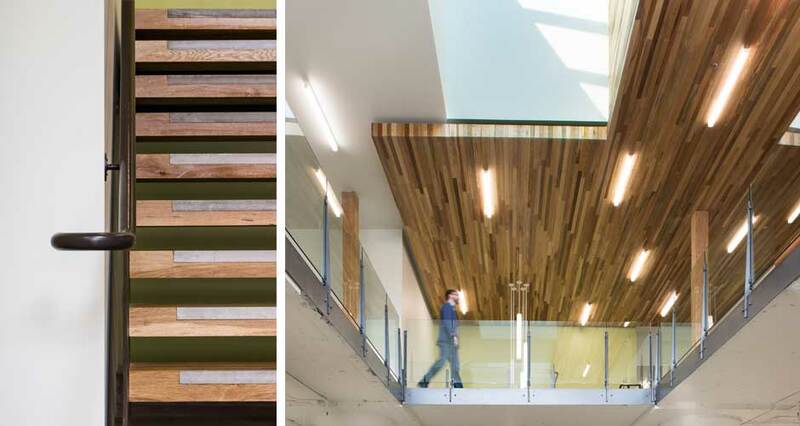 A sculptural panel made with reclaimed wood emphasizes the two-story volume and creates a visual connection between the ground floor and skylight opening as it folds to engage the ceiling. Modern design language was intentionally utilized to highlight and create contrast between “old” and new. 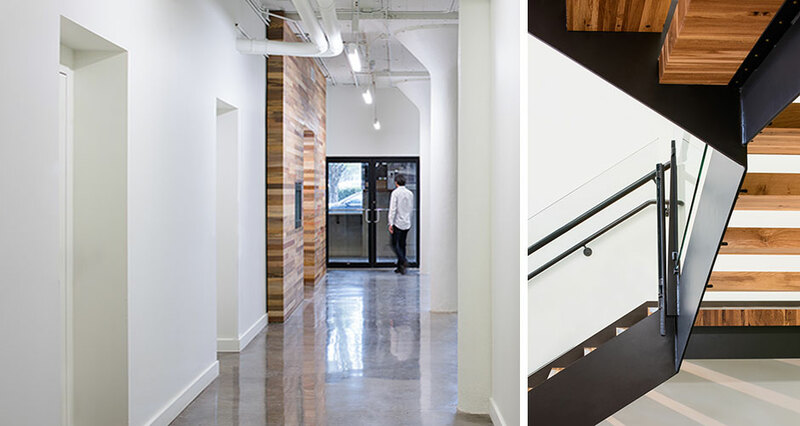 This 97,055 SF creative workplace is targeting Energy Star Building Certification. 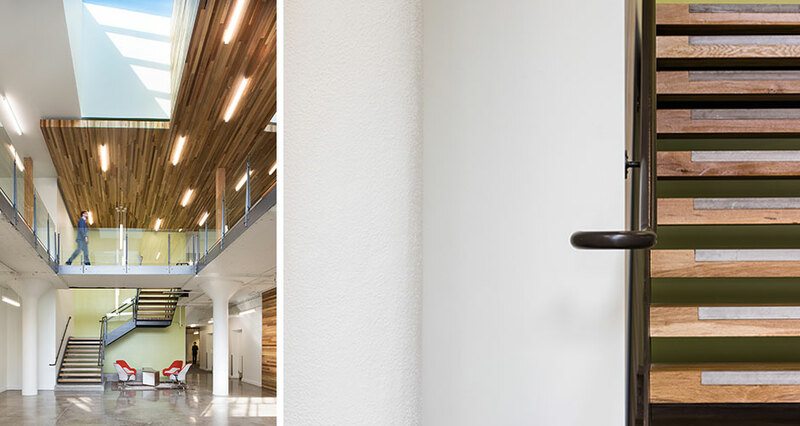 Innovative and sustainable design elements include folded, reclaimed wood panels by Viridian, low-emissive glass to reduce energy consumption, and 100% LED lighting in the lobby. Additional upgrades to the corridors, bathrooms, and gym are key restoration features that convey the importance of this landmark project.